Back in 1958, ABC corralled top TV ratings with its Tuesday night shoot-‘em-ups featuring Cheyenne, The Rifleman, and The Life and Legend of Wyatt Earp. In those early days of television, with only two other networks broadcasting in the United States, ratings competition was fierce. For the 1959-1960 season, NBC overhauled its Tuesday evening lineup and came out with guns blazing. 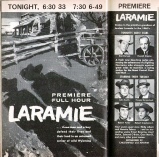 On September 15, 1959, NBC premiered Laramie in its prime 7:30-8:30 (Eastern) time slot. The sixty-minute Revue (Universal) Studios western starred John Smith, Robert Fuller, Hoagy Carmichael and Bobby Crawford, Jr.
Laramie’s first episode, “Stage Stop”, introduced the Sherman brothers who were struggling to eke out a living in 1870s Wyoming territory. Slim and Andy Sherman (played by John Smith and Robert Crawford, Jr.), inherited the family ranch after their parents' untimely passing. War veteran Slim finds himself responsible for raising his younger brother, repairing and refurbishing a long-neglected ranch, and providing a ‘stage stop’ for customers, employees, and horses of the Great Central Overland Mail stage line. The third resident of the Sherman Ranch is Jonesy (Hoagy Carmichael), surrogate uncle, chef, concierge, and overall conscience. Into this testosterone-laden household of domestic bliss comes Jess Harper, played to rascally perfection by Robert Fuller. A gunslinger, sometime gambler, and all around ne’er-do-well, Jess Harper was a man whose lifestyle kept him always on the drift … until he ran into the Sherman boys. So began the four-year, 124-episode run of one of the first ‘adult’ TV westerns. to chaperone, and Eddy Waller's role of stage-driver, Mose Shell, was expanded. 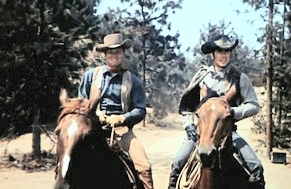 Slim and Jess rode the range, bachelors at large, during the last half of the 1960-61 season. Laramie’s third season, 1961-62, introduced new cast members Dennis Holmes as orphan Mike Williams, and Spring Byington playing Mrs. Daisy Cooper, housekeeper and surrogate mother to Slim, Jess and Mike. With the addition of these two characters, the Sherman Ranch became more family-oriented. In 1961, Laramie also had another ‘make over’ of sorts – it became one of the few shows broadcast “in living color on NBC”. During the third and fourth seasons, Stuart Randall, who played the part of Sheriff Mort Cory, became a semi-regular. In the final year, 1962-63, there were no major cast changes, but the series' central theme shifted. Where earlier scripts featured Slim and Jess against the world, many now centered on a single character while the other merely bookended the episodes. It became standard to see “Tonight Starring John Smith” or “Tonight Starring Robert Fuller” after the opening theme and credits. Laramie’s final episode, “The Road to Helena”, was broadcast on May 21, 1963.